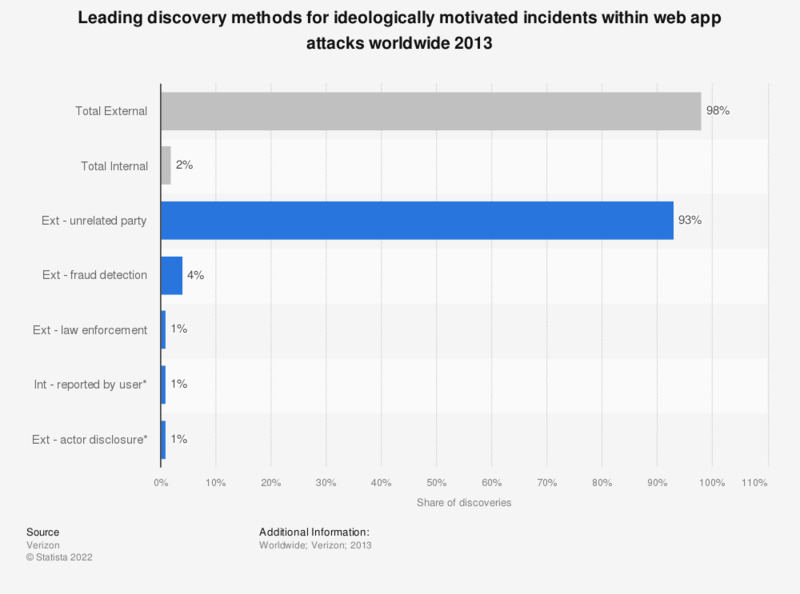 This statistic presents the information on the leading discovery methods for ideologically motivated incidents within web app attacks worldwide in 2013. It was found that 93 percent of the discovery methods were through external unrelated party. Statistics on "U.S. companies and cyber crime"
Which of these types of security threat defenses does your organization currently use? Where are you seeing the greatest rise in potential IT security risk? Has your organization identified a first responder team to deal with cyber attacks? Does your organization have an incident response plan to deal with cyber attacks? How vulnerable do you feel your company is to a ransomware attack over the next 12 months? Have you and your insurance broker discussed your cyber insurance coverage options during the last 12 months? Does your organization have a stand-alone cyber insurance policy? Which of the following exposures are covered under your cyber insurance policy? Has your organization had a cyber insurance claim during the past 18 months? What are the biggest threats to endpoint security in your organization?